The ocean hammering on the beach with the tide ripping along the sand is tonic for my snow weary soul. The salt air is homogenous with my skin, my senses are soothed… finally. I love the snow, especially at the beginning of the season, but I think I am not naturally as kindred to it as I am the warm salty air. There are not too many people in Puerta Vallarta at this time of year. I am told it’s the shoulder season which to me means “peaceful”. For this cold to the bone girl, 80° with not a cloud in the sky means that all is right with the world. 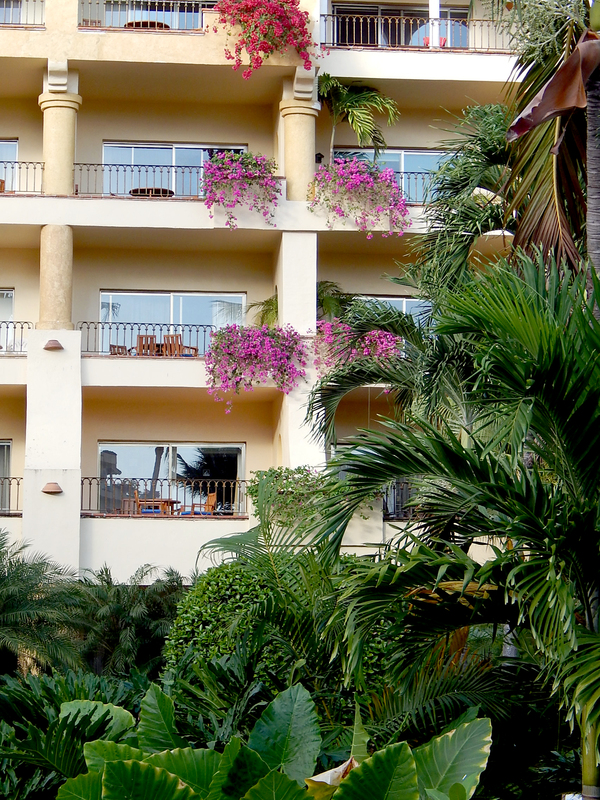 Velas Vallarta is really a large resort, nine stories tall, every room with a balcony facing the sea. The U-shaped surrounds a long lush garden with a meandering swimming pool that drifts towards the surf through elegant palms, brilliant bougainvillaea, cactus’ and succulents, even the occasional small dinosaur iguana lingering by the stream filled with golden koi. The balconies drip with flowers from one balcony down to the one below, and the primal screech of peacocks fills the air now and then. Yup, at this moment and in this place all is right with the world. I wander down to the beach because I can’t help it and take in how beautiful Bay Bandaras is was with the Sierra Madre mountains plunging right down to the sea on the other side of the harbor. The mountains have a cloud all along the top of them which almost look like snowcaps, a reminder of where I came from, and how lucky I am for this reprieve. But the breeze is warm and I realize I am hungry. There is a beautiful restaurant on beach, how lucky am I. It has a raffia interior roof and no real walls on the outside. The scent from the grills along the buffet promise an interesting lunch. Better with the first of vacation margaritas. It’s hard to fathom that just a few hours ago it was cold in Vermont, and now it’s tropical, lush and green, the air filled with bird song and surf. I do wish my daughter Lauren was with me. I miss her a lot now that she’s moved out west. I am going to find a way to bring her this sense of lightness that fills me now. I think of all the friends I would love to be sharing this wonderful moment with too. I wish this feeling for all of you. How are their fish tacos? We are always in search of “The Best Fish Tacos”! Enjoy! Wicked. PV has great food!